On arrival at Entebbe International Airport, you will be received by our experience delegate who will guide through this safari offering you all the necessary briefing regarding the safari. On your journey to west Uganda, you pass by the pre-historic Fort Portal town and later arrive at Ndali Lodge. The lodge has an all-round scenery of the very old volcanic terrain, the Rwenzori Mountains in the background plus the Bunyarunguru Crater Lake. After the lengthy journey you will dip in the cool swimming pool, trek around the beautiful lodge-gardens or unwind on the terrace. Overnight: Ndali Lodge (Lunch & Dinner) We were all amazed by not only the beauty of Uganda but by also by the outstanding hospitality of its people. Of the sites which were planned on our itinerary, we received more than we had anticipated and this gave us a feeling of being home. 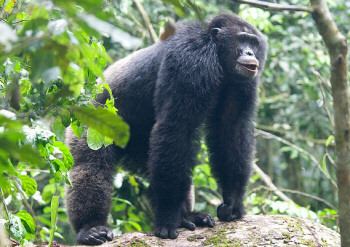 Enjoy the morning tracking the habituated chimpanzee families within Kibale Forest. It is such a memorable experience going after these chimps in their very natural habitat as they feed, swing about in the trees and play. Although they are hard to see, the forest is filled with sounds of their echoing. In the afternoon you will be able to visit the Bigodi Wetland Sanctuary which supports a variety of wildlife including animals, butterflies plants and an array of bird species among which are the uncommon Papyrus Gonolek and the Great Blue Turaco. You will also have a chance to tour the community projects which are being financed by the local tourism. Later in the evening you will dine and wine at the airy terrace as you enjoy the beautiful scenery. Overnight: Ndali Lodge (Breakfast, Lunch & Dinner). Depart for Queen Elizabeth National Park. On route, take a short walk in the foothills of the Rwenzori Mountains and take in the views of this magnificent mountain range. Alternatively drive straight to the park and take a game drive. What you see depends on the season, but the Kasenyi plains are excellent for sighting lion and large herds of Uganda kob. The Mweya peninsula offers excellent game drives with magnificent views across the water to the Rwenzori Mountains. Mweya is one of the best places to look for leopard, which live in the dense, scrubby thickets. Today you will leave for Queen Elizabeth National Park and on the way you will trek on the foothill of Mountain Rwenzori enjoying the spectacular views of the splendid Rwenzori ranges. Optionally, continue directly to the park to have a game drive. The wild animals you will come a cross will much depend on the season of the year. But expect to see lions plus numerous Uganda Kobs within the Kasenyi plains. Overnight: Mweya Safari Lodge or Jacana Safari Lodge. The Kyambura Gorge is an exceptional natural setting that is severely different from that the neighboring grasslands. In this gorge you will get the opportunity to track chimpanzees which are the closest relatives to humans. The chimp families are very mobile so at times finding them may involve trekking for long hours. After lunch enjoy a boat cruise on the spectacular Kazinga Channel which connects Lake Edward to Lake Albert. The Kazinga is habitat to one of the biggest populations of hippopotami in Africa with numerous elephants, buffaloes and other animals which gather to drink water. The channel also attracts several water birds like the pelicans and the African Fish Eagle. Overnight: Mweya Uganda Safari Lodge or Jacana Safari Lodge. Today you will proceed to the famous Bwindi Forest driving past the Ishasha region depending of the condition of the road and there you will see the exceptional tree climbing lions. The lengthy drive in adulating landscapes will finally end at Volcanoes Bwindi Lodge which overlooks the tall forest tress. Basing on the time of arrival, you may tour around the lodge consuming the spectacular sights of the mountain streams or visit the neighboring villages. 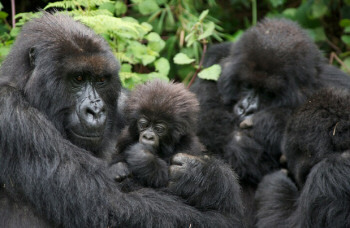 Overnight: Gorilla Forest Camp, Bwindi Lodge or Engagi Lodge. Following breakfast you will go gorilla tracking. This will journey you through the densely forested steep hills until you finally meet these tranquil gorillas within the green plant cover. It is such a wonderful yet memorable encounter. Tracking in the dense Bwindi requires physical fitness as it may last the entire day. Optionally there are alternative activities and expeditions in and about the national park. Have a guided walk in the verdant rainforest which is habitat to numerous endemic types of birds, butterflies plus uncommon plant life. The walk provides wonderful photographic sceneries and in addition, the well knowledgeable guide will brief you about this internationally important haven. Visit the local villages to learn about their community projects like the Amagara project which helps the resident farmers plus their communities, as well as the Bwindi Community Hospital which began as a health clinic beneath a tree but now offers the basic medication plus educational services to more than 60000 people. Unveil the traditional of the exciting Batwa people (pygmies) who are the tribal residents of this forest. The native residents of the Bwindi although today are no longer in this forest but still practice many of their traditional gathering as well as hunting skills.